HOLY MOLY It's a new year. This is always shocking to me how quickly the calendar changes as I get older! Hopefully you had a safe and fun New Year's Celebration! For today's favorite polish of 2015, we are discussing Frenzy Polish Catching Fireflies, from the Spring 2015 collection. 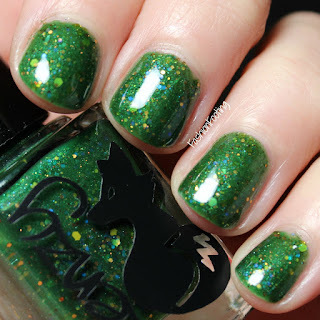 Catching Fireflies is a dark green base with blue, yellow, orange assorted glitter shapes. It's quite opaque on the first coat but does need two for full opacity. I also added topcoat. This green color is just lovely and I love how the glitter is visible in the base but it's not a jelly polish. Brand Blast: Glam Polish Finale! Brand Blast: Glam Polish Day 3! 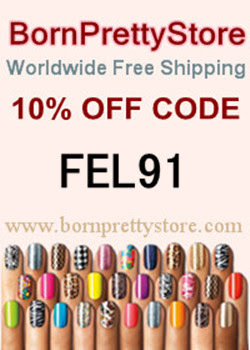 Brand Blast: Glam Polish Week! Essie Dots, Stripes and Flowers! Favorite Nail Polishes of 2015: Day 8!